I’ll be making View B, the longer with hood, cos England may be cold or it may not and I’ll be overdressed! Warning – the cutting goes on and on and on for this pattern. But the hardest part ‘downunder’ – (whoah smutty statement alert) seems to have been procuring the *%*&ing toggles. So I’ve made my own from FIMO – classy stuff eh?! 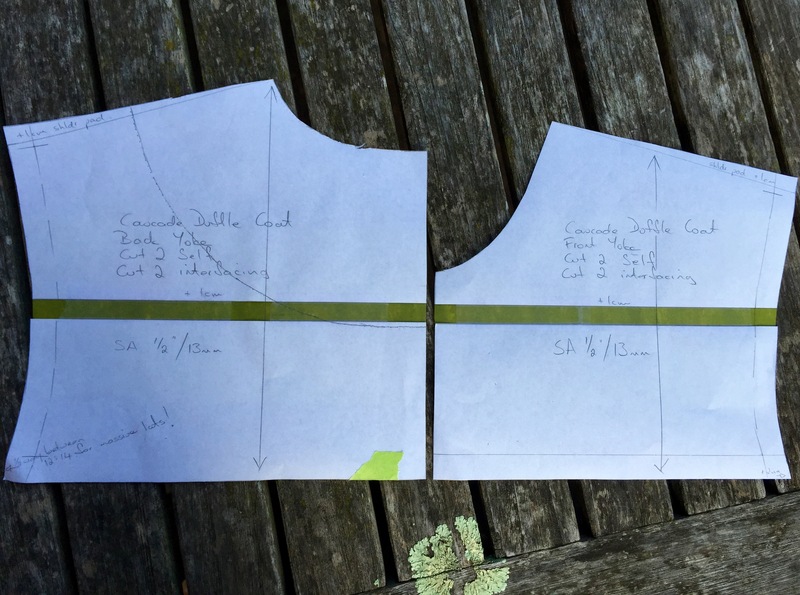 compared my body’s vertical measurements with the pattern – the waist was 1 cm higher at the side seam so I lowered the waist 1cm front and back. This is a loose fitting garment so I’m going to wing it in the bustular region. I have 2cm less ease than the 12cm ease allowed in the pattern. BTW how gorgeous is this version? The underarm to shoulder point on my dress block is 19.5cm, it happens that the Cascade was exactly the same and my thinking is that a coat has to have more ease to go over clothes, so I lengthened the armscye 1cm by adding to the cross front and cross back length and raised the shoulder point 1cm for a shoulder pad. Nice scribble – hints for next time when the dementia has set in. I fancy me a very small shoulder pad in the coat, for structure. The chosen fabric is a wool blend/plastic fantastic baby blue herringbone, $8.95/m from Spotlight – what a coup this was. I’m cutting the size 12, but due to my herculean shoulders, graded out to 14 at the shoulder line, there is only a 6mm difference between sizes at the shoulder seam. I could probably go further but I’m scared to make huge shoulders look hugerer like in this jacket! The pic above is short because I was ever so thrifty and interlined the ‘skirt’ section with the calico – go me – environmental warrior! As always the sleeve head took some fiddling and extreme pattern manipulation – it was exhausting. 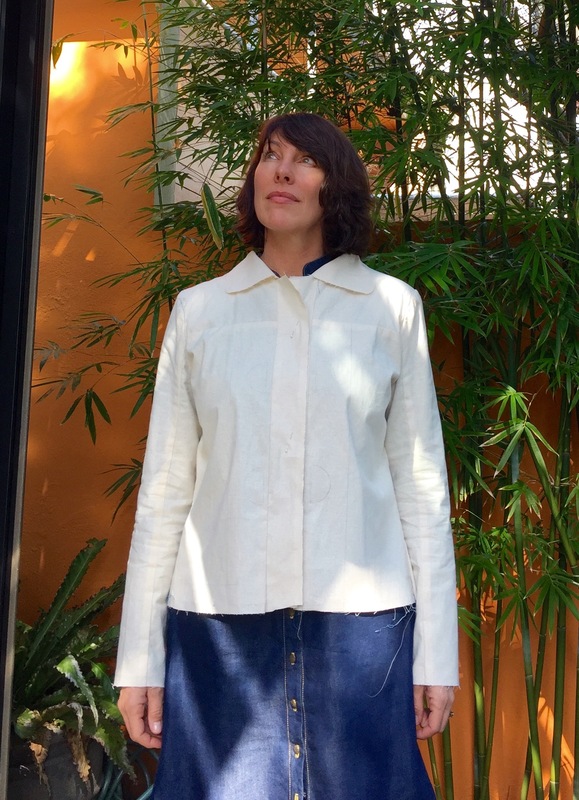 So to recuperate, I walked into Lee Mathews whose clothes are very pretty and quite bespoke looking, now she has veered away from beaches hippy chick and moved toward japanesy chic. The size 3 was generous everywhere but the front of the sleeve pulled crazily tight in the sleeve cap yet the back sleeve cap was swimming and boofy. The assistant assured me it was very excellent, bestest quality linen. That may be so madame, but if I cannot move my arms forward it is a straight jacket and not a garment I require. I walked out having not spent $475 and just a little smug that my coat was at least closer to perfection than Ms Mathews’ jacket would have been. Trying on RTW #sewconfidenceboosting – boom boom! I have to mention this website – Bootstrap Fashion. They’re a pattern company that print patterns to your personal measurements. I slapped down my $2.49USD, printed out the pdf and whipped up a toile in time for a visit to Geelong last weekend. Could not believe my eyes – it was a verrrry close fit on my Princess. I did tick the options – wide shoulders, broad front chest, broad back, short waist and wow – even she was impressed. They have a free surplice tee pattern, which may be worth a shot. I’ll make up Princess’s top soon for show and tell – woo hoo! Don’t miss the ‘resource’ section. It has actual drafting and sewing books available to read online. I’d love to hear what you think if you give them a go. Thanks Claire, not bad for $8.95 eh?! I love your blog ( and your humor) . Looking forward to seeing the completed jacket. Good luck with it . Thanks for the links as well. That personalized measuring site is a fantastic idea! Tee hee, hopefully not too inappropriate – that humour! I’d love to hear what you think of their patterns if you make one. Good plan. Because it is going to be cold. And rainy. And grey is how it looks everyday, so you will blend in nicely. Always great to be making something that fits rather than constricts. Just great. Lee Matthews is great for design inspiration – loved the sheer organza coats she was doing about 5 years ago, but so expensive! I like where your coat is going. Thanks Gail, slowly, slowly on this one! Oh I can’t wait to see the finished version of this! 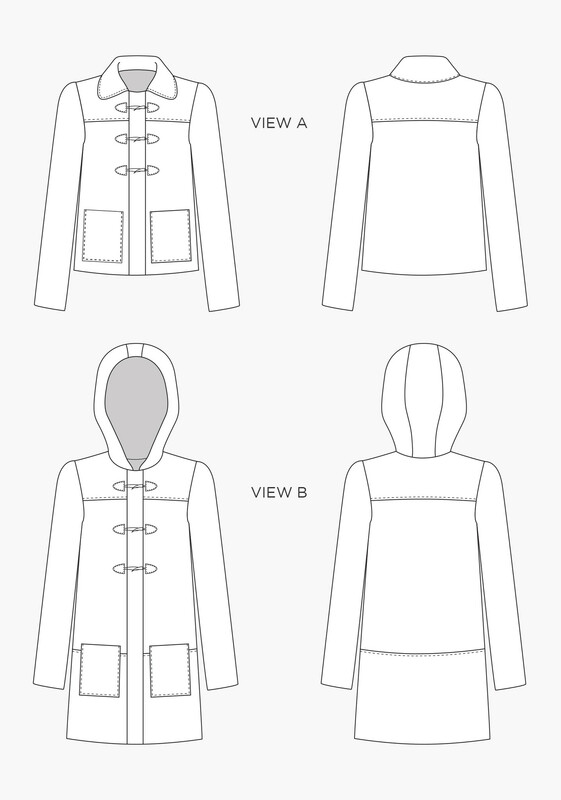 I’m toying with making my own parka … Never done a coat before though so a bit scared by all the fastenings! If I could offer 1 piece of advice it would be to get a hold of all your fastening bits and bobs at once. I’ve vacillated terribly over toggles, zips and linings – its sucking the fun outta the project. A cocoon coat like Bellbird’s would be a great starter coat. Best of luck with your parka, there are some fab patterns out there. Thanks to your heads up I have ordered a couple of Bootstrap patterns (loving those prices!) and planning to give it a shot over the weekend. Two very different ones so will see how sizing goes. As ever, I have no idea whether I’m long waisted, short waisted?? I know I have chunky calves and a wide back. Aaaaargh!! Oh I just saw this today http://youlookfab.com/welookfab/topic/short-waist-dressing-the-high-contrast-untucked-top. She talks about short waistedness and apparently you need to be able to fit 2 hand widths between underboob and waist to be ‘normal’ waisted. Princess and I are evidently short in the waist! Looking forward to seeing your makes from the Bootstrap Fashion patterns.